Hello and Happy Tuesday! Hope you are having a wonderful week so far! 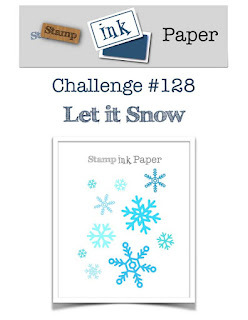 This week over at Stamp, Ink, Paper we have a fun Let It Snow Challenge! There are sooo many possibilities with this one!! 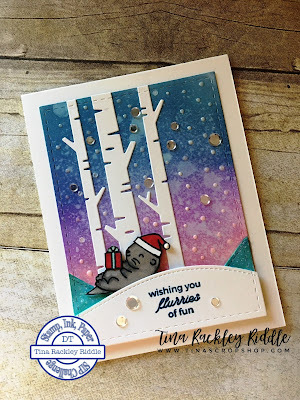 My original thought was to make a snow scene using the Lawn Fawn Birch Tree Dies and the design just expanded from there. What do you think?? First of all I cut my birch trees out in 110# Neenah Classic Crest Solar White Cardstock. Next I made my card base out of the same cardstock for a top folding card. For my ink blended background I used a piece of Bristol Smooth Cardstock.. I love the way distress ink blends on it! I started out by blending Broken China Distress Oxide Ink on the top of my Bristol panel. I blended it into Wilted Violet and then blended that into Worn Lipstick at the bottom of the panel. I decided that the top needed to be a bit darker so I blended in some Faded Jeans Distress Oxide ink. I used my Tim Holtz Distress Spritzer to spritz water and then dabbed a paper towel on it and heated it with my Heat Tool. Once I was happy with that panel I used my Lil' Inker Designs Stitched Rectangle Die to cut a panel out. I also used the top of the same stitched rectangle to make stitched details on the top of the birch trees. I adhered them with Ranger Multi Medium Matt. I then used more of the Neenah Classic Crest Solar White in 110# to cut out 3 layers of Lawn Fawn stitched hills. I adhered two layers of stitched hills on the bottom of the card with more of the Ranger Multi Medium Matt. For the top layer of stitched hill I used the same Lil' Inker Designs stitched rectangle die to make the stitching up the side and on the bottom so it would match the rest of the card and used foam tape on it to give it dimension. The snow was made by adding small drops of Nuvo Crystal Drops in Simply White. Once those were dry I added some Pretty Pink Posh Sparkling Confetti. 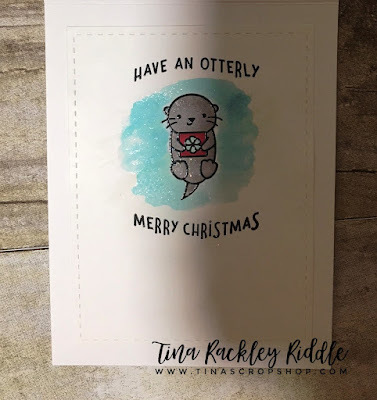 I used my Misti to add the sentiment from a Hero Arts Stamp set called Winter Animals. It was an add on set for the November My Monthly Hero Kit. My original idea was just to make a scene but then I realized it needed something extra. I thought about the animal silhouettes from the Winter Animal stamp set but since they were silhouettes and I had so much white, I thought the all black silhouettes might be too much. I decided to stamp one of the otters, the present and the santa hat from the Exclusive Lawn Fawn Simon Says Stamp Set called "Christmas Like No Otter". I used Stampin' Up! Stampin' Blends to color them in and I fussy cut them out. I used a black marker to color in the edges so as to hide my not so great fussy cutting. I first adhered the otter on the back slopes with foam tape.... then I realized that the back slopes should be water... Duh!! lol So I added some Peacock Feathers Distress ink to a small acrylic block, added a little water and used my aqua painter to pain the back slopes like it was a stream. I wasn't completely happy with how the water looked so once dry I used a stampin' blend marker to color over it. Leave it to me to change my plan.. lol I used a white gel pen to add a some small dots of snow to the water. I added more sparking Confetti to the front snow slope around the sentiment. Finally... I decided it looked pretty good. I added the panel to the Neenah Classic Solar White 110# Cardbase. I toyed with matting it but decided it looked better directly on the White. Whew!!! What a process this one was.